Painting for Singles and Couples, offering three special group rates for group of six people, group of ten people, and group of twelve people! 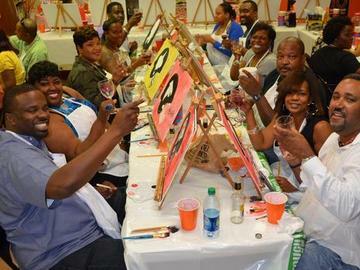 Come share good company, while listening to some great music from the house Dj, and foster your inner artist! Here is an activity design for first dates, husbands & wives, sisters, friends, mothers & daughters, engaged couples, fathers & sons, organizations and groups. Note: Seats are going fast, so call 404-919-9778 or Register online to reserve your seat Today!